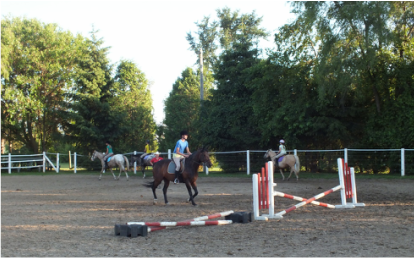 Students participating in our English riding lessons will learn skills in dressage, show jumping and cross country. Lessons are focused on advancing the rider's seat, confidence and knowledge in the arena, all while having fun. Prerequisite: In order to join this class, riders must have their full blue level. All riders joining English riding lessons must have a balanced and confident seat while walking, trotting and cantering. All new students need to book an assessment by TJ Stables instructors to verify riding level and be approved to participate in this class.